Like Jimmy Carter, I have known lust. In my case it is a neighbor’s Sweetbay magnolia (Magnolia virginiana), a perfect understory tree that remains evergreen in our winters with an early summer flower perfuming the air. 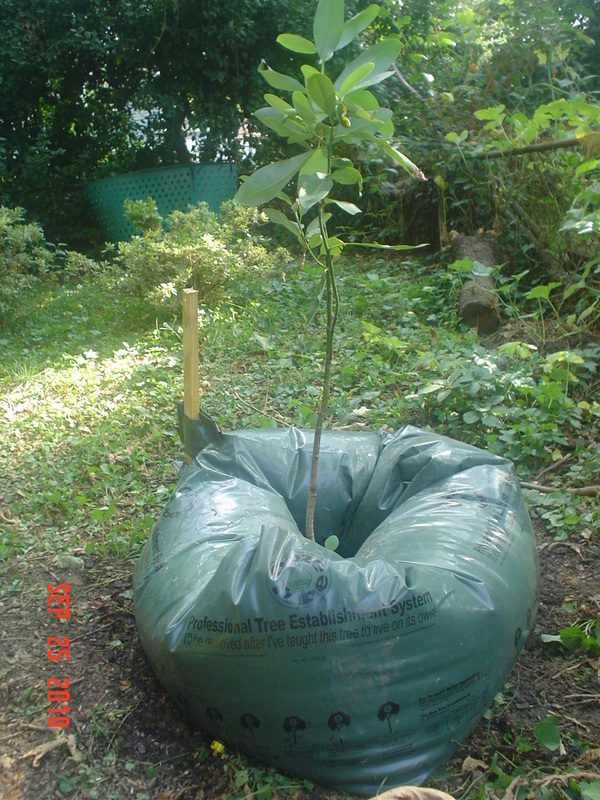 And then, joy of joys, I finally got my own cherished Sweetbay magnolia tree whip through the Arlington County tree distribution program this May! I carefully planted the tree whip, mulched and watered it twice a week through the summer drought – until I went on vacation. I returned to a browned twig that all of my prayers and watering could not coax back to life. How could I, a TreeSteward since 2001, have allowed such a thing to happen? I was bereft yet determined to turn this disaster into a positive outcome for other trees. I did some research with the assistance of Casey Trees and the TreeStewards Board of Directors decided that providing Ooze Tubes at our community education events would promote the importance of watering newly planted trees. These Ooze tubes (see photo above) can hold 15 or 25 gallons of water and will SLOWLY release it through the yellow regulator. The tube is wider than the traditional gator bag, thus putting the water closer to newly formed roots and serving as a protective barrier against the water evaporating. We make these Ooze tubes available at all of our information tables at Courthouse Farmers Market in Arlington, and Alexandria’s Del Ray market and Tree Sale on October 23. The initial purchase of Ooze tubes was made possible through the Arlington office of Virginia Cooperative Extension and we ask for a $15 contribution so we can replenish our stock and keep promoting watering. Stop by one of our information booths or email us at info@TreeStewards.org and we’ll put one aside for you to pick up. Instant karma guaranteed if you use one to keep a street tree alive. A redeeming miracle occurred last week when someone dropped off another Sweetbay magnolia they just hadn’t gotten around to planting. It is now in the ground in my back yard and this time an Ooze tube is protecting it! This entry was posted in Education, Tree Care and tagged ooze tubes, planting, water, watering. Bookmark the permalink.